As we wrap up Women’s History Month, I wanted to take a moment to recognize the women that are making history as our first employees ever! We tend not to think of our current situation as “history,” but in fact, it is. Paris and Nyana are building their own stories and contributing to the stories of Knit Marketing. We already can look back on the days of running around the USC campus, looking for the best quiet workspaces and all over LA looking for the best coffee shops as our temporary office space. In only 10 months, we feel like we’ve come pretty far. It was not intentional to select only female interns when we started out, but they rose to the top and were excited to be part of the founding team. So before we let the busyness of running a startup get in the way, I wanted to reflect on our very own women’s history. Paris Thomas is a senior in high school and wants to be a child forensics psychologist. She participates on her school’s debate team, and has been identified as the “closer.” Paris volunteers for more organizations and groups than I probably even know, but the ones I’ve heard her talk about are helping out middle schoolers in after school programs like iMentor Global, volunteering at a day care, and participating in student government. She also took an etiquette class last year, so she teaches us which fork we’re supposed to use at restaurants, and how to eat very lady-like. Paris loves to travel and loves making arts and crafts. She’s very entrepreneurial, as she has her own website where she sells repurposed and restored clothing items. She talks about her little sister more than anyone else and she takes her role as big sister very seriously. She has applied to several universities, has received acceptance letters from many, and is still waiting to hear back from her top choices. We’re hoping she chooses UC Irvine, so she doesn’t have to go too far (they also have some great courses on forensics, criminology, and social psychology that are right up Paris’ alley). At Knit Marketing, Paris has been in charge of Twitter and Facebook until she recently took over a main account for one of our clients and will be managing their cohesive digital marketing strategy. She likes spicy food and loves her dad’s Jamaican cooking. She likes to lip sync as she works, so I imagine her having full blown solo dance parties at home. 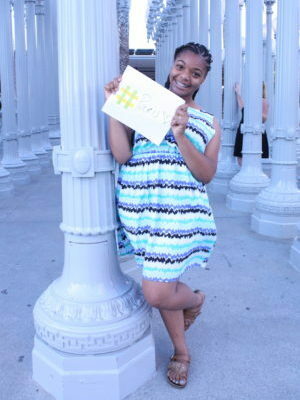 If Paris stays with Knit Marketing, she definitely has a future in sales and consulting. 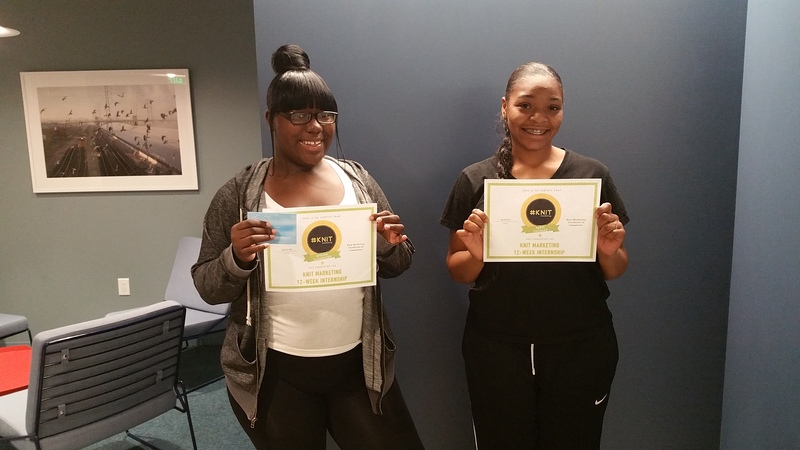 Nyana and Paris when they finished their 12-week internship. Nyana Slaughter is also a senior in high school and wants to be a Registered Nurse. She’s been assigned the task of helping any sick or hurting family member since she was a little kid. She claims that blood and guts don’t gross her out, but we tease her about being a bit of a germaphobe. If anyone in her life has to go to the hospital for any minor or severe problem, Nyana is always among the first to arrive. Nyana also works part time at a local grocery store, where she is picking up some Spanish words and learning a lot about customer service. She’s made it pretty clear that working for Knit is a very “bougie” work experience in comparison, and I take that as a compliment. She used to play rugby, but decided to sit out this year to focus on work and college applications. She has received acceptance letters from most of the universities she applied to, is still waiting to hear back from a couple, and is still deciding among her top choices; one of which is Mount Saint Mary’s for their nursing program. Nyana talks about her mom more than anyone else, and will most likely choose a school that is close to home so she doesn’t have to leave her bestie (of course, I’m happy she’ll be sticking around too!). At Knit, Nyana was in charge of Instagram and Pinterest, but also recently took over a main client account, for which she’ll be managing their overall digital marketing strategies. She loves macaroni and cheese more than life itself, and especially if it’s her mom’s recipe. At work, we have to hide away in a closed conference room, because Nyana has a fabulous and infectious laugh, and we just don’t want anyone to know how much fun we’re having. 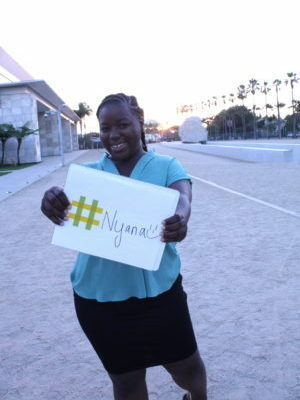 If Nyana stays with Knit Marketing, she has a future in event planning and project management. I am beyond blessed to have such a great founding team made of creative, fun, and brilliant young women. They teach me new things every week and challenge me to be a better leader, so we all continue to grow in this process. I hope they stick around for a long time, but even if they don’t, I know Paris and Nyana will be making history wherever they go! Thanks for reading our blog. We’d love to hear your thoughts, so be sure to drop us a line in the comments below. Thank you for coming to our Launch Party! Welcome to the Team Adewole Williams!